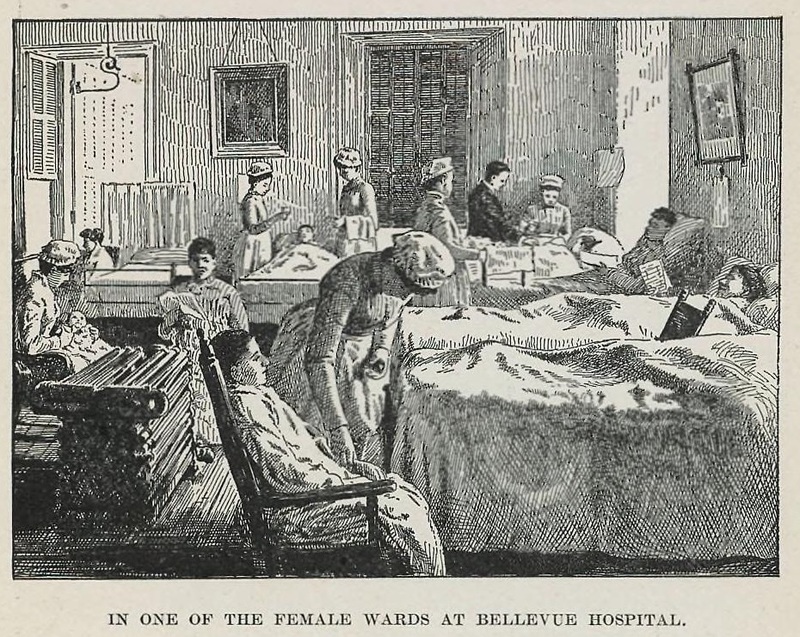 When Nellie Steele went to the Bellevue Hospital she was a comparatively young woman, and it was thought that after few days or weeks’ treatment she would be out again, cured of the disease from which she was suffering. That was nearly thirty years ago. Weeks, months, years passed away and Nellie still remained. She became a fixture and as much a part of the building as the dull blue stones of which its walls are made. She had the gentlest disposition, and her patience under suffering was a part of the small talk that everyone heard who visited Bellevue. The Bellevue, founded in 1736, is the oldest hospital in the United States. It is situated on the east side of midtown Manhattan, a few blocks away from the Empire State Building. When she first entered the hospital her complaint was diagnosticated as lead poisoning and general debility. The treatment indicated was given with no perceptible result. She seemed to fail slowly, and when everything known to the medical profession failed to be of any benefit there was a wise shaking of heads among the house staff of physicians. and they gravely came to the conclusion that they did not know what was the matter, a conclusion reached, as usual, after the stomach had been turned into a drug-mill and the system weakened by useless experimentation. 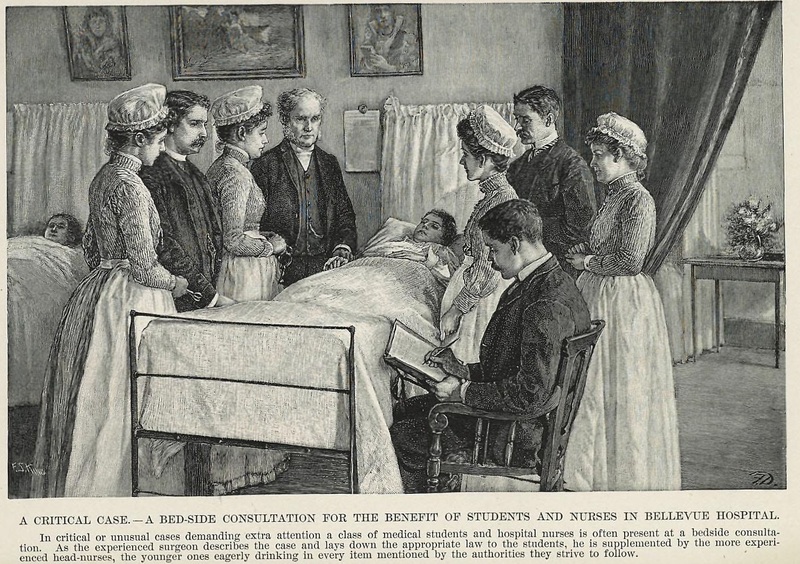 After several months Nellie became so weak that she could hardly move, and spent all her time in bed – where she would remain for the next thirty years. Her case has been a puzzle, and she has been watched by hundreds of physicians during her long time of sickness. One of her peculiarities was fits, which came regularly every two weeks. The attacks lasted about two hours. They were not generally severe. If they had been, her weak system could not have stood the shock. A slight shudder would pass over her body, her eyes would turn upward, and then she would become unconscious. There was no regularity in the fainting periods. Sometimes the faintness would appear every day, and then it would not come for weeks. It was a strange condition. Every indication of death would be manifested, and so perfect was the resemblance that, on one occasion, when two newly appointed orderlies saw her for the first time, they judged that she was dead and got the dead-box and carted her off to the dead-house. These ‘dizzy spells’ could be of surprisingly long duration. The shortest fainting attack lasted nine minutes; the longest seventeen days; the average was eight days. During these periods she did not eat. Stimulants were given hypodermically. Digitalis was freely used to strengthen the heart’s action. How she lived on from year to year no one could guess. The amount of food she ate would make the legs of a mouse weak in a week. The most interesting feature of the case, from a medical standpoint, was the irregularity of the heart’s action. There was a marked disturbance of the mitral valve and its flutterings could be plainly heard without the stethoscope. During the years that she has been at the hospital, save when she first entered, there has not been a physician who had the courage to give a name to her disease for publication. When Lawson Tate, the great English surgeon, was over here last year he was shown this patient and made a thorough examination of her. He concluded that there was some spinal trouble, but admitted that it was the most puzzling case that he ever saw. Robert Lawson Tait (who was in fact Scottish) was a great surgeon of the era, though little remembered now. He performed the first appendectomy of the modern era, and invented several procedures which are still used today. His specialist interest, however, was in abdominal and gynaecological surgery – so he may not have been best placed to diagnose her. During the last few months every part of her body was dry and hot to the touch. She seemed to have a high fever, but was not restless and made no complaint. Her pulse was so rapid that it could not be counted. Her body was greatly emaciated, and the flesh was unusually sensitive. Nellie’s foot was badly injured when another patient, who was delirious, threw a crutch at her. After infection set in the surgeons decided to amputate. The operation was quickly performed, the stump being carefully ligatured and the patient taken to her cot. She rallied from the shock. On the second day after the operation she had one of her faint periods, and her body had the appearance of death. There was no pulse discernible at the wrist, the heartbeat was only a slight flutter, and the breath was confined to the throat. At the end of ten days there was no sign of life. Still, it was not deemed safe to say that she was dead. One can understand the doctors’ reluctance to declare her dead: they had nearly buried her alive on a previous occasion, after all. At the end of fourteen days the body began to putrefy and it was then known that Nellie was dead. Well yes, that would seem pretty emphatic. The doctors finally had an opportunity to establish what had killed her, so an autopsy was performed. They had a surprise. The heart was examined last. It was larger than normal. The knife sank easily through the muscular tissue and then came to an obstruction. It was near the mitral valve. A careful dissection was made and when the flesh was cleared away the surgeon held in his hand a perfect needle. It was encysted. How it got there is not known but it must have been many years ago. That it caused all her ailments by interfering with the circulation there is no doubt. It sounds unlikely that a patient could survive for thirty days with a needle in their heart, let alone thirty years – but it’s not impossible. In the nineteenth century seamstresses, maids and artisans of all kinds used needles in their work, and accidents were commonplace. Needles were left pinned to clothing or unwisely kept in breast pockets – and the medical literature is full of the injuries they caused. There are many examples of patients killed by a sewing needle which unluckily punctured the heart; but there were also a few who survived. In 1850 a Dr Neill reported finding a two-inch needle in a patient’s heart while performing a post mortem. He noted that the dead man ‘had never complained of having received any injury nor manifested any tendency to suicide.’ Still more dramatic was a case from 1876 in which a six-year-old girl fell over while playing and drove a large needle into her own chest. Within a few months she developed worrying symptoms of heart disease, but remarkably she survived for another twelve years; at autopsy the needle was discovered wholly embedded in the wall of the heart. 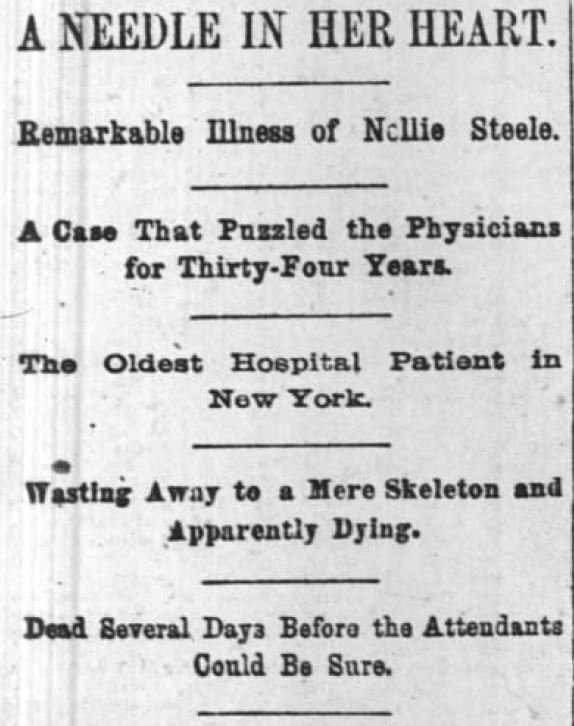 It’s strange that the case of Nellie Steele was apparently never reported in a medical journal – and that may be because there is some doubt about the veracity of the tale. But if the newspaper report is accurate, her survival for so long may be medically unique.